It’s just about impossible to walk through a big boarding facility or barn without the topic of sweat patterns and saddle fit coming up. If all you are looking at when assessing how well your saddle fits is the sweat marks after a ride, you are only getting a small piece of the overall picture. Here is how the theory goes. 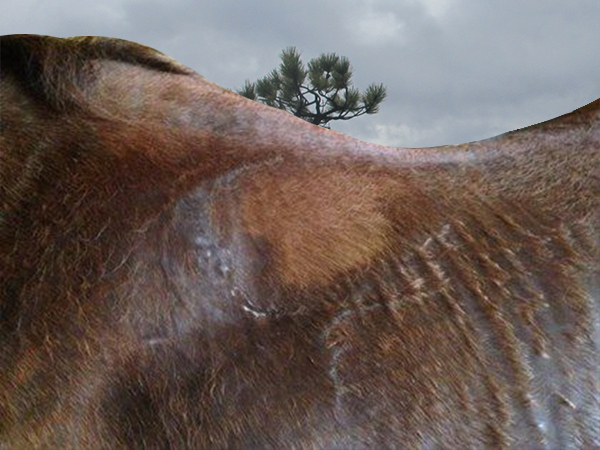 When you take your saddle off at the end of a ride you should see even sweat marks on both sides of the spine that resemble the bottom the saddle. If you see dry areas, it is supposed to mean that the pressure there was so high that it shut down the sweat glands. The overwhelming majority of riders totally believe this is the absolute gospel of saddle fit. If this was actually true and all you had to do was look at a horse’s back after a ride to tell if a saddle fit or not, I could teach a 5 year old how to be a saddle fitter. In the 30 years I have spent around horses with the last 17 years fitting thousands of horses I have seen horses with perfect sweat patterns with white hairs right in the middle of them. (When you see white hair showing up that is an undisputed sign of pressure and an ill fit saddle). I’ve also seen horses with the ugliest sweat patterns imaginable, asymmetrical and spotty, and the saddle fit impeccably with the horse perfectly happy and in no discomfort. So there are definitely several holes in this theory. First, let’s talk about what’s going on under the saddle. In order for a horse to sweat there has to be air and movement. More sweat shows up in areas that have less contact (i.e., lower pressure) and more movement which lets the air circulate more freely. Our goal in saddle fit is to have the most contact in the center two thirds of the saddle tapering off to the front and the back. So the center of the saddle has the most contact and the least amount of movement. The majority of the movement is at the front (under the pommel area) and at the back (under and behind the cantle area) of the saddle. The horse sweats more in the front because as the shoulders rotate they cause air to move under the front of the saddle. The same thing happens in the back as the hind legs and hips move up and down allowing freer air flow. Because there is little movement in the center of the saddle and therefore little air circulation the horse sweats less in that area. 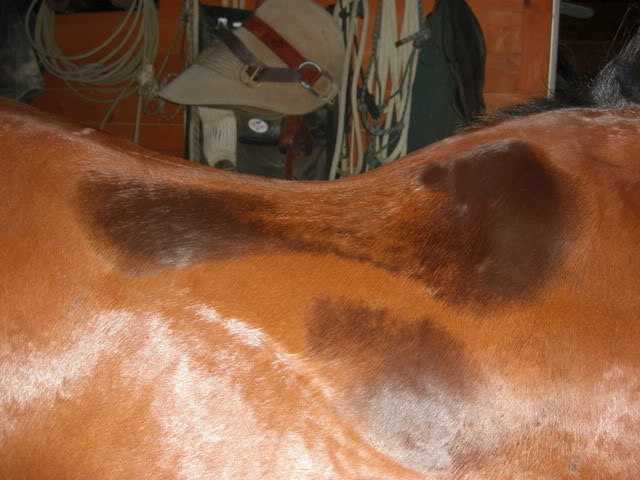 That is why if you look at the dirt marks on your saddle pad after a ride you will almost always see heavier markings in the front and the back of the pad where more air and dirt has access under the saddle and less in the center. So what about the horse that is sweated up evenly front to back. If you ride your horse long and hard enough moisture will naturally move from the high sweat areas into the center of the back. Lastly, horses are just like people. Some sweat more than others. It’s that simple. Another part of the puzzle is the pads we use when riding. The type of pad used under the saddle has a huge effect on the sweat pattern. Cotton and wool absorb more sweat than synthetics. Synthetics generally give the best sweat patterns. They don’t absorb as much as wool and cotton so more sweat stays on the horse’s back and makes a more even pattern. So if all you care about is an even sweat pattern than go with a synthetic pad. The saddle still might not be fitting properly but at least you have a sweet looking sweat pattern. It is not uncommon for a wool or cotton pad to produce dry areas in the front or the back with some sweat in the middle which is the exact opposite of what we learned in the preceding section. Pads like Supracor with their honeycomb technology create sweat patterns of all different kinds. The honeycomb in the pad pushes air down into the horse’s back as your body weight comes down into the saddle and then pulls air back up as your weight rises back up. This cooling effect gives some of the oddest sweat patterns I’ve ever seen. So when is a dry spot a cause for concern? We have to determine if the dry spot is an actually pressure spot or a just a benign non-pressure spot. If a dry area is the size of your hand or bigger there is generally no cause for concern. But if you have a dry area the size of a mini donut surrounded by an area of sweat you could have a problem. In the long run dry spots to me are only a call to attention. If I see a hand sized dry spot I will check the area for tenderness. If the horse is not obviously sore there than I don’t worry about it. But I will keep my eye on that area in future rides. If a larger dry area starts to shrink down in size over a few rides of similar duration than I will definitely check out how the saddle is fitting. Keep in mind that past saddle fit issues that caused areas of dry spots or white marks may never sweat in that spot again if the damage was severe enough. So if sweat patterns don’t really tell much about saddle fit what does? One of the leading indicators of an ill-fitting saddle is the horse’s attitude. If your horse is usually good on the trail and he starts tossing his head, laying his ears back or swishing his tail more than normal this could be a sign of discomfort. Soreness when grooming or running your hand lightly down the back. Edema – swelling due to pockets of fluid. Reluctantance to go down hills. Unable to relax under the saddle. In conclusion use the sweat pattern only as a call to attention and then dig deeper if you think there is a problem. Look at attitude, look for soreness and swelling. If you see a weird sweat pattern but all else is well just go and enjoy your horse! Boy, did this give me something to think about and then rethink it again. Perhaps I am not totally nuts after all about these sweat patterns, dry spots and white hairs. Like life itself, there are so many variables and nailing down the EXACT cause may never be known, so deal with what you do know and go from there to solve a potential problem. Don’t create a problem where there might not be one. Thanks Dave and CJ. This made my day! Thank you for this very informative article. I’ve saved it in my reference file. Wow, You have taken a ton of worry off my shoulders. Thank you thank you. Thanks for the kind words, glad we could help!